Some marinas and seaside towns go above and beyond to provide information to ensure that boaters know that they're welcome, well-informed, and in good hands. When I started researching the town of Harpswell, Maine, I was more than pleasantly surprised to find loads of helpful intel online. You can tell from the start these folks are excited for you to enjoy their beautiful town and harbor. From historical sites to outdoor adventures, this little hamlet has it all. For those of you looking to explore Harpswell, Maine by boat, read on! 128 square miles of area, but only 24 square miles of that is land? Sounds like my kind of town, Harpswell! Roughly 5NM due south of Harpswell, you'll cruise by a picturesque, well-marked rock that is Halfway Rock. Purchased at auction on September 20, 2014 for $283,000, Halfway Rock Light is now maintained by Ford Reiche, a business man from Auburn with a passion for historic preservation. He has since invested a significant amount in restoring the lighthouse. Read the full history of Halfway Rock Light here. The easiest way to visit Eagle Island State Park is by way of the Marie L, which departs right from the Dolphin Marina dock Friday through Sunday at 10am and 12pm. Built in Falmouth Maine in 1950, the Marie L is a 36' Handy, with sleek lines and reliable design. Marie L has been a fixture on Casco Bay since her first launch, and holds the longest standing contract with the US Postal Service from when she delivered mail from Freeport to the residents of Bustin's Island for more than 50 years. Guests aboard the Marie L embark on a brief coastal tour before being escorted onto the island, where they explore the museum and trails for ~2 hours. Pack a picnic and enjoy lunch overlooking some of the best views on the Maine coast. If you keep binoculars on board, bring them along: the coasts and islands of Maine provide habitats for a diverse population of nesting seabirds, including the eider duck, black guillemot, greater black-backed gull, herring gull and osprey. The George Trues Grist Mill, built in 1867, operated through use of tidal power. Today you can visit the remains of the dam at Tide Mill/Grist Mill Road on Harpswell Neck, which have created a reversing falls effect. Chris Saxon from Dolphin Marina gave us a great suggestion: Take a dinghy excursion through the Reversing Falls, which dump into the Mill Pond, or use their complimentary kayaks to explore the local waters. Harpswell's Bailey Island Library Hall (pictured above) was built in 1911 as a a lending library and social hall in part to provide a library to the local islanders, who were separated from the nearest library on Orr's Island by a ferry crossing. The islands were bridged in 1928 once the Bailey Island Bridge was constructed, and Bailey Island Library Hall now functions solely as a social hall, hosting weddings, lectures, dances, and concerts. Of note: Psychoanalyst Carl Jung gave his first seminar in America, on dreams, at Library Hall. Harpswell's Old Meeting House was built in 1759, and was designated a National Historic Landmark in 1968. The Harpswell Historic Park and Museum is open Sundays, 2pm - 4pm Memorial Day to Columbus Day. For the full history of the Meeting House, click here for the account from the Harpswell Historical Society. Harpswell has more than its fair share of musicians! Each week a new band takes the stage in the Harpswell Bandstand by the Sea Concert Series at the George J. Mitchell Field. June through August, concerts take place Thursdays 6pm - 8pm, then switching to 2pm - 4pm Sundays in September. Click here for the full roster of bands & their descriptions. Ragged Island off of Harspwell is the former home of poet and playwright Edna St. Vincent Millay, winner of the Pulitzer Prize for Poetry in 1923 for "The Ballad of the Harp-Weaver." She was born in Rockland, grew up in Camden, and purchased Ragged Island with her husband Eugen Jan Boissevain in 1933, where she summered until she passed away in 1950. Peruse some of her works, which were very much inspired by her life in Maine, as you relax on your dock or mooring. In conjunction with National Trails Day from the National Hiking Society, the town of Harpswell laid out a challenge to all residents and visitors. Download the Hiking Challenge guide to get started. Harpswell has other fun outdoor activities for kids as well – click here for their animal track finder, bug finder, and coloring sheet! Check out more great hiking trails from the folks at the Harpswell Heritage Land Trust, including Dolphin Marina-recommended Curtis Farm Preserve. Dolphin Marina guests have access to complimentary bicycles, so take a tour of the area. There are plenty of great dining options, with the Dolphin Marina's on-site restaurant being no exception. Around the bend pick up dinner to cook yourself at Potts Harbor Lobster on Ash Point Road. Take a beach day - a 20 minute bike ride will get you to Stover's Cove Beach on Bridgewater Lane. While the Maine State Music Theater's performance of EVITA wraps up this weekend, there's always more magic on the way. Hitting the bright lights on July 20 is Fiddler on the Roof, Mamma Mia as of August 10, and The Irish... And How they Got That Way as of August 16. If you're able to access a car to make your way to North to Brunswick, make a night of it! Check out the full schedule here. We cruised the coast of southern Maine for about 10 days last summer (2015); we stayed at many fine places and had lots of good food. Our stay at the Dolphin stands out. Great setting; great facility; great staff; the meal we had in the restaurant was the best of the week. Just dined and stayed for the fourth time this year. Crew and staff are always spot on. We tested the chef this time with a guest who has onion/garlic allergies... The guest was extremely pleased with the entree - way to go chef! The Key Lime pie is among the best we've ever had. Click here for more of the same glowing reviews on Active Captain. 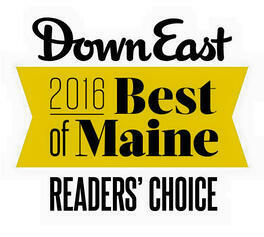 To boot: Dolphin Marina & Restaurant recently won two Down East Magazine's Reader's Choice awards for "Best of Maine: Restaurant With A View" and "Best of Maine: Chowder." 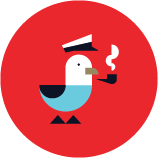 BoatUS Members get 10% off transient slips and 15% off repairs, and fresh-baked muffins await guests every morning (swoon)! We hope you'll include Harpswell, Maine in your summer float plan with a stop at Dolphin Marina.